Yet, worrying won’t change them. It won’t help at all. Sometimes, it’s just good for me to walk around outside–even if it is just in my own yard–and look at the fascinating creations of God that are right there. Flowers, butterflies, tiny blooms on weeds. Birds flying overhead, lizards scurrying about, dragonflies that come to hover near me. There, I find a calm and a respite from responsibilities, if only for a short while. I have been praying lately about many things, wanting to trust God with people and situations, instead of worrying. 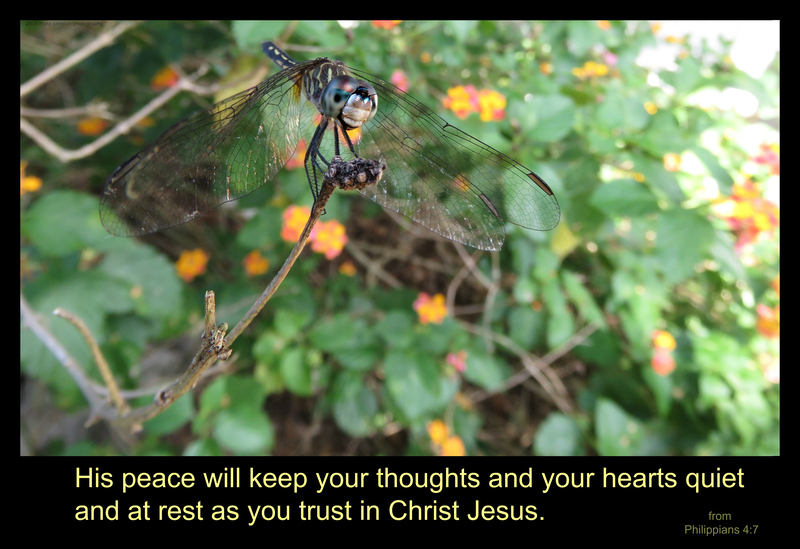 This entry was posted in Christian devotionals, Christian wallpaper, computer wallpaper, dragonflies, emotional health, nature, peace and tagged anxiety, belief, Jesus, peace, Philippians 4, quiet, rest, worry.